Some claim that there’s a criminal element, a dark moody side, that lies dormant within us, only to be woken and stirred, waiting to be revealed. This is the proverbial “sheep in wolves clothing,” as all we need is to be provoked, a motive to act radically. It’s human nature to snap from being normal to becoming abnormal, violent, or insane. People are capable of doing anything, both good or bad, and can occur at any moment. An event of distress can suddenly take place. Regardless of what socioeconomic background we may come from, unlawful behavior can cross any boundary. As a result, criminal activity can occur. Just because a certain unlawful act happens to be minor in nature, just a misdemeanor, that doesn’t mean it’s not as relevant if it was a serious act. That threshold, that line has been crossed, as it’s an unlawful act none the less. For most of us, the criminal, the “bad guy” is usually someone else, the other person, and never us. But what’s known is that the mind can suddenly snap, unannounced, where motive and intention can run deep, which is fueled by stress, rage, or passion. Our perception can become our own self conceit. We at times, can suddenly begin making poor life altering decisions. We have motive to do something deceitful and thus create a plan, then rage drives us to perform and execute the wrongful act. We knowingly carry out our urges and desires, knowing that we’re doing something wrong. We’re triggered once we’re challenged or cornered, as we snap out of normalcy, and there’s no turning back. Once were apprehended however, what occurs are a myriad of excuses which surfaces, from that inner sanctum of cunning craftiness. We can then become sly, shrewd, and sneaky. Some of us are just better at it than others, and as a result don’t get caught, and get away scott free. We constantly flirt with breaking the law, thinking that no one is watching or cares. So we run stop signs, talk on our smartphones while driving, cheat on our spouse, shoplift. We become daring one step at a time, and hope to get away with it. The sensation becomes breathtaking, thinking we’re above the law. We become devious, as our human brain begins to process fantasies of amazing possibilities, and daring pursuits. We think how far we can go, how much we can get away with. We push our moral boundaries, as we believe if we’re not cheating, we’re not trying. The entire entertainment industry and the “fake news” media, are prime examples of this. The movies, crime and con dramas, reality TV, social media, all develops hype that creates this mass hysteria. What they do is offer escapism in one form or another. The more tragic or intense that the story or situation is, the better that the ratings become. What’s then translated, is that the fiction or the myth becomes reality. What was once accountability spirals into forgetting or ignoring our ethical principles. Our social obligations then becomes replaced with mindless rage, as we begin to experience temporary insanity. Throughout society, at every socioeconomic level of life, when push comes to shove, we scramble to find rationale, a reason to commission or commit unlawful acts to ourselves or others. We then plan to commit some type of bad deed, do something that is an unlawful act. We cross the line, from being a good mindful god fearing person, to committing some type of sin. Hypocrisy and double standards then sets in, as blame is passed on to how corrupt society or others are, so it’s not entirely their fault. We’re able to justify anything, conjure up conspiracies, then attempt to slip away and escape, until we’re eventually caught. What those who breaks the law does is begins to mold their talents, their unique abilities and capabilities, and tailors them to the act that fits their rage. For one reason or another, they’ve become social outcasts with no morals. The duty to be right instead of wrong, escapes them. Political corruption, corporate embezzlement, committing murder or armed robbery, crimes of passion, are where these instances are most commonly found. What we all have is the innate means within us, we have the ability to commit a wide range of anti-social behavior, where at any moment we can snap. While all most citizens will do is commit minor infractions, others will become monsters in their own skin, become forces of evil and disrupt. The inherent motivation to commit these infractions however, is the same. What it comes down to is personal gain, to satisfy some type of need. These basic needs are usually fear, hate, or greed. At times, it could be for the power, the rush, the need for dominance that we all crave, which activates the “switch” that crosses us over to the dark side. It gives us extreme thrill to the senses, which provokes the need to acquire the object of desire, in question. 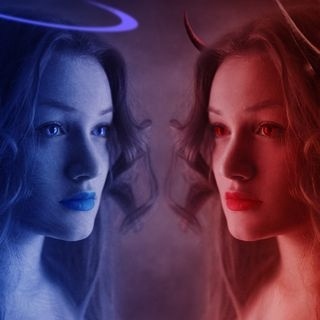 It could be a crime of passion, of ego, for the hate of self or another. It depends on the individuals fantasy and their sense of reality. Within this fantasy, there’s the intention to extend it into the real world. Then the bad deed is performed. What these idealizations activates is a transfer from the subconscious mind, and then injects it into the reality of the conscious mind. From the interior of these darkened reaches, comes the intention of deciding to carry out the unlawful act, all without remorse or a feeling of guilt.